What is the link between “Goodnight Moon” and academic excellence? Or how about “Green Eggs and Ham” and career success? The question may seem like a riddle, but the answer is no joke. A 2012 national study by The Annie E. Casey Foundation found children are four times more likely to leave high school without a diploma if they are below proficient reading level in the third grade. Three years earlier, the 2009 National Assessment of Educational Progress reported 67 percent of fourth-graders scored below proficient levels on reading tests. 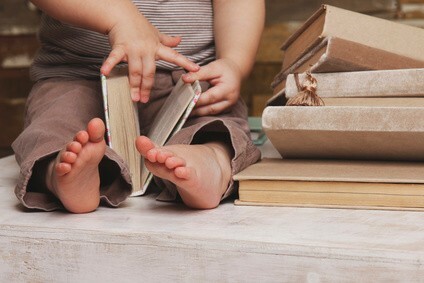 A child’s literacy development from birth through early elementary school can be a strong indicator of later life success, according to the 2012 study. That’s why reading skills need to be developed long before children enter the classroom. That’s why literacy education needs to begin as soon as children exit the womb and enter the world. That’s why programs like 1,000 Books Before Kindergarten are awesome. The program’s mission is to promote reading for newborns, infants, and toddlers, as well as promote bonding through reading. I encountered 1,000 Books Before Kindergarten while researching an article about early childhood literacy for the local newspaper. The program is offered locally through Streator Public Library, but it also is available nationally. Anyone can participate for free, with or without a local facility to sponsor. The gist is this: Read 1,000 books to your child before kindergarten. From birth to the time school starts, just read a book from cover to cover. Repeats are allowed, so if your child wants to read “Are You My Mother?” 990 times and then 10 other books, you aren’t breaking any rules. Reading one book a night is 365 in a year. In two years, that’s 730. Three years of daily reading would be 1,095, leaving you ahead of the game with two years to spare. In June 2014, the American Academy of Pediatrics issued a policy statement promoting daily reading with children, beginning in infancy. The 1,000 Books program is a handy starting point and good incentive to keep parents on track. 1,000 Books Before Kindergarten offers all of the resources a family needs on its website: program instructions (available in English and Spanish), reading log sheets, printouts for milestones (reaching 100 books, 200, 500, etc. ), and a reading list suggesting books for youngsters. 1,000 Books Before Kindergarten is beautifully simple and horribly underrepresented (its Facebook page has about 1,800 likes; on Twitter, fewer than 850 followers). It’s worth playing the role of Scheherazade to the children in our lives. She told 1,001 stories in 1,001 nights to save her life; surely, we can read 1,000 stories in 1,826 nights to improve our children’s academic (and lifelong) success. Read more Kid Lit Blog Hop posts here. EDITOR’S NOTE: Portions of this blog post also were published in an article written for The Times newspaper (Ottawa/Streator, IL). To read the article, visit http://bit.ly/1OchPUj. This entry was posted in Children and Family, Reading and tagged 1000 Books Before Kindergarten, family, kid lit, literacy, reading. Bookmark the permalink. July 15, 2015 at 9:57 p.07. I can’t imagine many better things to see than children who develop a love of reading. great post and so important. I began reading to my son as soon as I was pregnant and I have never stopped. Now he loves to read and make his own books. Wow. I’ve heard all the stats you cited, but I haven’t heard of 1000 books before kindergarten. Love it. I will use this information. Thank you for sharing. I came via #kidlit blog hop. Love this idea! 1,000 seems like so many, but that math makes sense. 1,000+ is so doable. I’ll be sharing this! July 16, 2015 at 9:57 p.07. I absolutely love this idea. I’ve been reading to my kids since the time I found out they were in the womb. We frequently visit the library for story time and check out a ton of books to read at night. Thank you for sharing. Stopping by from Kid Lit Hop. My son is 9. Just the other day we were talking about the first book I read to him the day I brought him home from the hospital – Love You Forever. We have read with each other almost every day since then. He has an amazing vocabulary for his age and is a fan of reading. It is so important for kids to see reading as something enjoyable instead of as only work. I hopped over from the Kid Lit blog hop. Thanks for sharing such an important topic with the Kid Lit Blog Hop! July 28, 2015 at 9:57 p.07. I like a reading goal that is very clear; 1000 books before kindergarten sounds daunting but then those board books are short and you can read 5 books in one sitting! Thanks for sharing at the Kid Lit Blog Hop! !